ConceptDraw DIAGRAM is a powerful tool that helps you create a process map diagram quickly and easily. Fine-tuning the objects in ConceptDraw DIAGRAM allows you to create a really professional finished article.ConceptDraw Arrows10 Technology gives drawing connectors a smart behavior that provides quick and precise placement, allows for easy changes and automatic rearrangement. A Bubble chart is a diagram that displays three dimensions of data. Each object’s size and position represents the values of its associated dataset. Tree Auto-connection mode allows you to draw a bubble chart in moments. Thanks to ConceptDraw Arrows10 Technology you don’t need to concern yourself with technical points like how to connect or place objects. Your only concern is what to draw. Everything else is taken care of by ConceptDraw professionals. 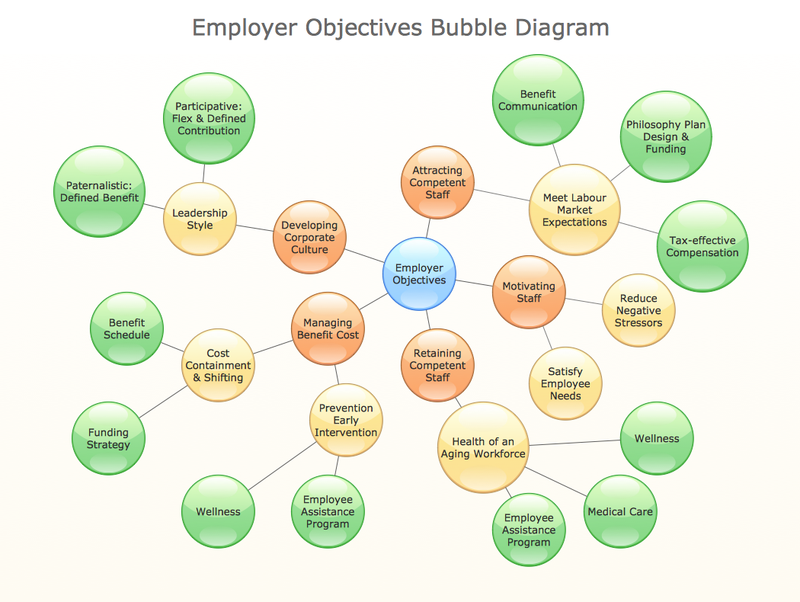 Let′s see how it works when creating bubble chart. Bubble Charts are convenient way to visualize ideas and concepts by organizing them in a hierarchy. To show the importance of ideas you can use different bubble sizes and colors. ConceptDraw DIAGRAM v12 diagramming and vector drawing software extended with Bubble Diagrams Solution from the "What is a Diagram" Area affords you the easiest and fastest way for designing professional looking Bubble Charts.